Believe it or not, Americans used to go to the airport just for eats and giggles. Over three and a half million Americans will take to the skies this Thanksgiving, and I would feel confident in betting that very few are looking forward to it. Air travel these days is marked by delays, limited legroom, and unending, cookie-cutter air terminals that make New York look like Minneapolis look like Vienna look like LAX. So would you believe me if I told you that people used to go to airports just to eat food? Just for fun? To understand why Americans would do such a thing, we have to first think of the air travel business as something it hasn’t been in years: an upstart new technology, one that badly needed market share. In 1965, a full three decades after the advent of commercial flight, Time magazine noted that eight in ten Americans had never been on a plane before. (Compare that to 2000, when half of Americans took at least one round-trip per year.) Airlines needed to pitch air travel to the nation, and the airport, as one author wrote in a 1940s guide to commercial air transportation, was “the sales counter of air transportation.” Good airports, the manual advised, should have “high-class waiting room, ticketing and restaurant facilities,” the presence of which would “retain” passengers who might otherwise opt for a train. The night view from the Terrace dining room in Washington's National Airport. (Flickr/Boston Public Library). It turns out that wasn’t so difficult. By the 1950s, airports were certainly travel hubs, but they were also, strangely, something like tourist attractions. People sometimes came to the airport expressly to watch planes take off and land. (The lack of post-9/11-level security didn't hurt.) The 1957 debut of the Boeing 707, the first commercially successful jetliner, only stoked the public’s interest in hanging out in airports because they could. Not everyone could fly, or fly frequently, but watching planes “was a marvel that they could personally participate in,” says Whitaker. So people came to the airport restaurants for birthdays. They came in for dates. A Cleveland Plain-Dealer ad from 1965 summons patrons to a Cleveland airport’s New Year’s Eve celebrations. 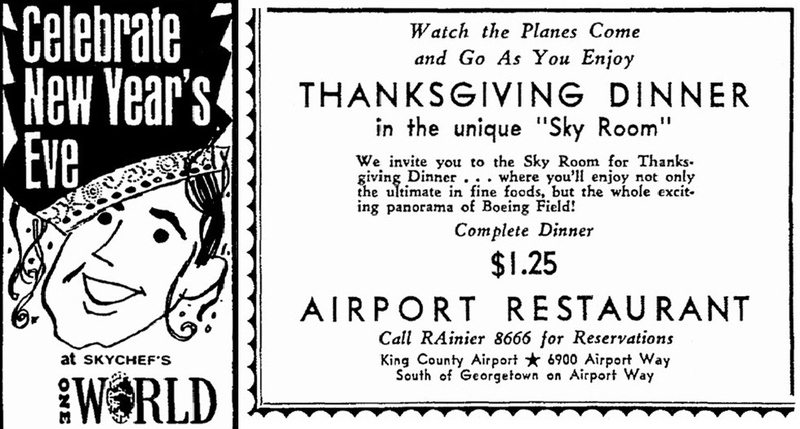 A 1941 ad in the Seattle Daily Times invites customers to “watch the planes come and go as you enjoy Thanksgiving dinner in the unique ‘Sky Room.’” Family, turkey, and airplanes—for just $1.25 per person! But by the 1970s, Whitaker says, the heyday of destination airport restaurants was over. Many airports “couldn’t get someone to take the contract to run a restaurant. It became difficult [because airport restaurants] were seen as such losers that sort of depended on whether you were a hub or not,” she says. Part of the problem? The novelty had worn off, particularly among the hoi polloi, who were riding airplanes in greater unwashed numbers. It turns out that airplane travel, as the novelist Sinclair Lewis observed in 1929, “is the most monotonous and tedious form of journeying known of mankind, save possibly riding on a canal boat through flat country.” Oof. Of course, modern airports still have restaurants. Driven by new scarcity of food on domestic flights (often nary a peanut packet in sight), some have even asserted that gourmet airport eats are making a comeback. But cough up enough money for a ticket just to get a squidwich and a nice glass of red? Are you nuts? In December of 2013, LAX’s iconic Theme Building restaurant closed, perhaps for good. The building, built in 1961, is emblematic of restaurants of the era, with a spacey dome that once slowly rotated to give patrons a 360 degree view of the airport, the horizon—and beyond. "The problem is, it was built when bringing your family out to have dinner and watch the airplanes was a cool thing to do," Gina Marie Lindsey, the executive director of the airport’s management company, told the L.A. Times. "Passengers [now] won't leave the terminals to have dinner there because it's unpredictable how long it'll take them to get through security again." Special thanks to Jan Whitaker for her insight.